As the owner of a retail business, improving your store’s foot traffic is critical for you to drive sales. Before you contemplate effort-intensive and time-consuming initiatives to attract customers to your retail shop in Sydney, why not make a quick start by giving your store an eye-catching makeover with easy-to-build shelving systems? Not only will they upgrade your store’s interiors but smart shelf configurations will also help you free up in-store space and lend your shop’s interiors a neat and organized look. While choosing the right shelving system, it is imperative that you don’t compromise on the quality of your store’s retail shelves by settling for cheap & unreliable Sydney shelving shops. Instead, opt for a specialist shop fitter so that you don’t have to worry about unfair pricing or waste money on low-grade materials & fixtures. Ever wondered why shop shelving is so crucial to the success of your retail business in Sydney? Apart from the fact that stylishly designed shop fittings are visually appealing, modern shelving systems such as eye capturing glass shelves on slatwalls or inside glass display cabinets, gridmesh acrylics and gondolas help you present your merchandise more attractively with their functional and versatile designs. Moreover, shelf displays are integral to your in-store marketing as they ensure that your goods are easily noticed by your store’s visitors. Hence, it is no wonder that many small business and supermarkets in Sydney are increasingly relying on the clever presentation and positioning of their shelf displays to improve the visibility of their retail shop’s merchandise and make their goods readily accessible to prospective buyers. Considering that no two retail businesses are similar, shelving in Sydney also varies from one shop to the other. Hence, a garment rack or a table display that is ideal for promoting apparel will not fit the bill for a magazine or newspaper store, multi-tiered racks being best suited as newsstands or magazine shelving units. Have you observed how pool & spa shops make frequent use of pegboard gondola shelving to direct the attention of visitors to their pool supplies? One of the guiding factors behind their decision to choose a specific type of shelving unit is the merchandise that is in focus. It is well-known that glass shelving is a much sought-after display option for pool & spa shops. Apart from providing ample space for storage, glass shelving kits can instantly enhance the ambience of a store and make it look more luxe when complemented with effective lighting. Because pool stores routinely deal with a wide range of swimming pool supplies, gondola units, paired with metal volcano style pegboard back panels, are well-suited for them. 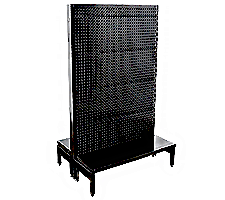 While the heavy-duty gondola provides the necessary durability and display area to showcase bulky pool equipment & pool merchandise, the pegboard backing, with its evenly spaced perforations, enables store managers to arrange hooks on the pegboard’s available area and hang articles in quirky shapes and sizes. Mdf slatwall gondolas are also quite popular with hobby shops. You may have seen how hobby shops tend to position these retail merchandisers near the checkout area to promote small and readily purchasable items. Such clever positioning can trigger impulse purchases as the products are in clear view of the prospective buyers when they enter the store or while they are at the payment counter. Choosing the right shelving system for your retail business is a decision that merits careful evaluation of a range of factors. Apart from the product itself which will determine the type of shelf display that is most optimal for your store, it is of utmost importance that you select shelving units congruent with your store’s brand image and the overall theme of your shop. Simultaneously, the profiling of your target audience, easy accessibility of your goods, and seamless flow of in-store traffic are factors that will collectively play a deciding role in the choice of appropriate shop fittings for your store in Sydney. Space optimization: If maximising your retail space is a key priority for you, then opt for slatwalls, grid mesh. They help you make effective use of your store’s walls, thus offering your additional space to display more products and serve a larger number of customers. Visual Aesthetics: Probably nothing beats glass shelving when it comes to adding a touch of luxury and elegance to your store’s interiors. Glass creates an optical illusion of extra space – one of the many reasons why stores resort to glass shelves for their shopfitting needs. Slatwall also score high on visual appeal as they can easily blend with the design and décor of your store’s interiors. Ample display space: Freestanding fixtures such as two-sided gondolas with adjustable shelves will be your best bet here. They are a common sight in grocery stores, supermarkets, and pharmacies as they can hold numerous items and are routinely used for merchandising prominent display locations, usually the centre of the store. Seasonal display: Pegboard and slat wall are apt for you if your store requires a continual change of merchandise. Depending on what’s trending and relevant for the season, you can effortlessly tweak the pegboard’s pegs and hooks or add/remove accessories to accommodate new products. Gridmesh panels are relatively lightweight and easy to move around or mount on walls, thus making them equally worthy of consideration for seasonal displays. Specialty displays: If your retail business is into the selling of niche or specialty products, then explore displays that are specially customised to house niche items such as wines, spirits, jewellery, confectioneries, and products requiring refrigeration. Cost: Lastly, your budget will have a significant influence on your selection of a shelving system for your store. If you are cash-strapped, then grid mesh display, or masonite pegboard wall sheets will help you keep your tight budget in check. Slatwall panels are a smart choices when you are shopping on a reasonable budget while gondolas, specialty displays are the expensive options that you can consider if you can loosen your purse strings even more! All said and done, do remember that picking the right shop fittings for your retail store can be an overwhelming activity, especially when you are unexposed to shop shelving nuances. Thankfully, you can take the stress out of choosing your store’s displays by entailing the services of a leading shelving shop in Sydney. A specialist shopfitter will guide you through the entire process and provide you with fairly priced shelving solutions that are easy to assemble and can be installed with bare-minimum effort. Engage the services of one now to boost your store’s foot traffic, improve the in-store shopping experience for your customers, and generate more sales.